Guitarist Enzo Rocco was born in Crema, Lombardia, Italy on October 5th 1963. He graduated at DAMS in Bologna and works as a musician and musical co-ordinator of the Bottesini Bassofestival in Crema. Since 1985 he practised as a guitarist accompanist in different situations (from duo to big band, especially that directed by Angelo Faglia) and took part in jam sessions and concerts in clubs. 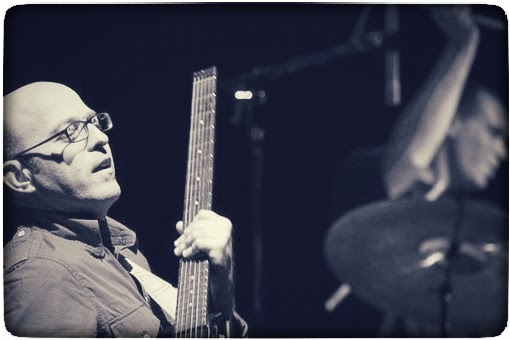 Between 1991 and 1995 he directed a trio with the double base player Luca Garlaschelli and the drummer Massimo Pintori, which participated in the anthological CD Accordo 1994 and collaborated with solo guests like Tino Tracanna, Paolo Tomellieri, Carlo Bagnoli, Sandro Cerino, Rudy Migliardi... 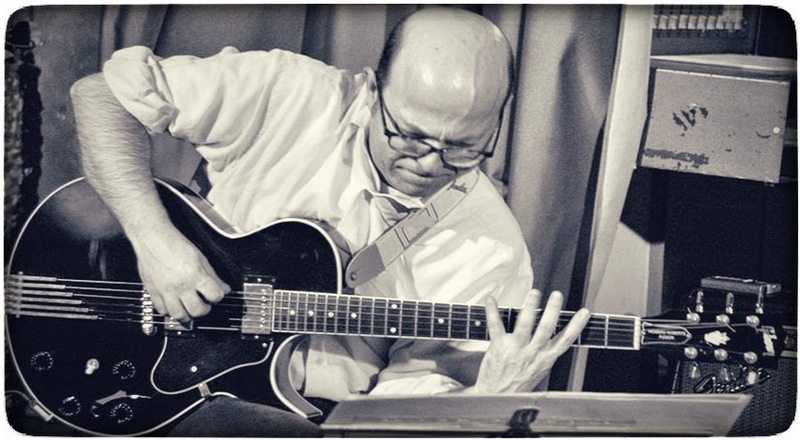 He was marked out as one of the best young musicians at the Roma Festival Jazz in 1992, and in 1993 was short listed at the Eddie Lang competition for jazz guitarists during the Monteroduni Festival. 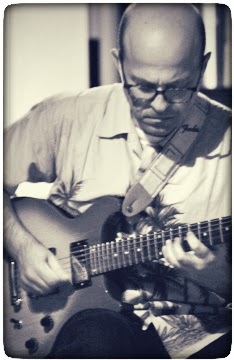 “Jazz and irony, world music and amusement, dance and improvisation: the music of the "wacky Italian" guitarist Enzo Rocco is a mix of contemporary jazz, free improvisation and folk music from all around the world always dressed with that generous amount of sense of theatre that always make so tasty his shows”. He was also engaged in environments different from jazz ones, like those of the music for theatre and songs (i.e. arrangement of the CD Piuttosto che by Costi and Pellegrini; participation in the performance A Paz of Pierpaolo Marini; performance of music and poetry Il libro di te ovunque with Alberto Mori; participation in the project Italian Jazz Sound of the singer Mimma D'Avossa; collaboration with the actress Kicca Bertolone ). 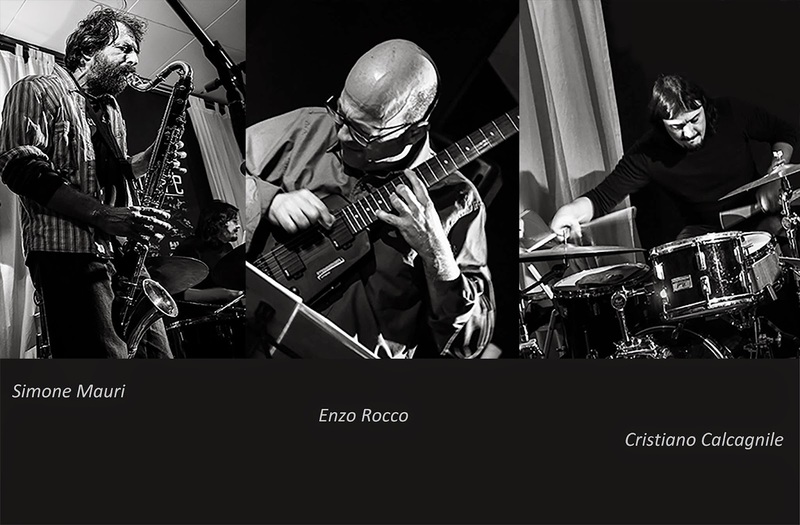 He currently plays in the group Transit of the saxophonist Marcello Noia where Daniele Cavallanti plays too, and is a member of the etnojazz quartet directed by Luca Garlaschelli that played for the actor Moni Ovadia and with the singer Tiziana Ghiglioni. Since 1998 he takes part in improvised music concerts in London with musicians like Lol Coxhill, Veryan Weston, Mark Sanders, John Edwards, Gayle Brand, Steve Noble, Alan Wilkinson. He has been playing in different countries: Italy, France, Great Britain, Germany, Belgium, Netherlands, Spain, Lithuania, Russia, Japan, Argentina. Direction of Tubatrio with tuba and trombone player Giancarlo Schiaffini and drummer Ettore Fioravanti with whom he took part in different international Festivals and recorded the CDs Tuba Trio (Caligola 1996, with Rudy Migliardi instead of Schiaffini) and Bad news from Tuba trio (Caligola 1999, guest Eugenio Colombo) and "Tubatrio's Revenge" (Caligola 2003); Collaboration with Carlo Actis Dato in duo (CD Pasodoble, Splash records 1998); Duo with the drummer Stefano Bagnoli (the CD Marché aux puces was presented at Monza Festival "Special Guest" on june 2000); Direction of Gruppo Musica Estemporanea, small orchestra devoted to improvisation and experimental music; Participation in a group composed of the English musicians Veryan Weston, Lol Coxhill and Steve Noble. In my childwood I grew up with Verdi’s operas that my parents listened to all the time at home. Rather consequently when I was 14 I began to collect a series of LPs called “Folk Music from Italy”. Genuine popular music recorded “on the road” by Alan Lomax and others ethnomusicologists. Each LP dedicated to a different Italian region or to some special kinds of music (work songs, wedding dances, funeral marchs and so forth). A bit later I found out some interesting rock or jazz musicians introducing Italian folk influences in their music. As a young music listener I was fond of that kind of music, I have never been interested in rock music instead. My musical roots are Italian folk music and Verdi’s operas. It was at 16, two years later, when I bumped into Eric Dolphy. Two further years and I came across Stockhausen’s “Gesang Der Junglinge”. And I bought the last record just yesterday: the BBC Scottish Symphony Orchestra playing Ivor Gurney’s “War Elegy”. Never heard before. To be sincere. Not to follow the rules of a “genre”. If the music is sincere it will create its own rules, which will exist just until next time. “Surprised” is not the right word. I don’t remember to have been particularly surprised. I’m often happy with the music I can do. I’m often unhappy, too. Sometimes some unexpected things happen: those things make me think that I’m walking in the right direction. But I’m not surprised when they arrive (not too seldom fortunately), I’m disappointed when they don’t because it means that I have missed an opportunity. caza menor (duo pablo ledesma) from Enzo Rocco on Myspace. Huge importance. Technique (in your hands, in your head) and skills and knowledge and culture allow you to continuously find ideas, to raise problems, to create solutions. I don’t believe in “spontaneous art”. Art is to find a technique for realizing an aesthetic idea and/or to reach an idea investigating a new technique. Especially when talking about improvised music. Once again the sincerity. But I appreciate also the ability to communicate with the audience, whatever this means. And I appreciate the irony, too. Good = comfortable and easy to produce the sound you want to produce. Banal. I’m sorry. After a while my “perfect” guitar becomes bad. I’ve been changing guitars since ever. Unbelievebly I’ve been using a new one for four years now. Becoming older I need an easy to play instrument. And a cheap one. I can produce all the music I want not depending any longer on the labels. But nobody listens to it (nor buys it!). Why should anybody listen to my music? Too much music around. I don’t want to listen to that mountain of music I find everyday into my computer. I know, I’ll lose many masterpieces, but also a lot of rubbish. Life is short. No time. Sorry, I must dash, I’m going to visit the Galleria degli Uffizi in Florence. I’m rather satisfied with the sound I have. Or I don’t worry too much about it, maybe. I rather look for a collective sound mixing my sound to the ones of the musicians I play with. Yes. Banal, once again. Your intervals, your rhythms…everything depends on your sound. Or you chose that intervals, that rhythm in order to produce that sound. When I was younger I used to spend the half of my spare time listening to the music, the other half reading some literature classics. Now I spend more time attending literature than listening to the music. Literature is very important to me. I love painting too, of course, but I possess less instruments for understanding it. I have a “naïf” approach to visual arts (but I couldn’t live without going to visit Rome or Florence or Venice now and then). And what I need also is to watch some good films (once a week, sometimes twice). Fellini, Kurosawa, Antonioni, Bergman, Rossellini, Kubrick………..aaahhh!!!!!!!! What are your motivations for playing? To satisfy my curiosity. To communicate with other thinking beings. To organize my ideas. To challenge myself to explore new paths. To reach, if possible, an acceptable level of wellness for my mind and for my body. Not able to tell about a single work. It’s absolutely true that I tried to play some kind of “mainstream-jazz” for many years before understanding that it was not my music. I loved it, but I was also interested in other things. Understanding that I had to find my own way to play “jazz” and above all meeting older and more experienced musicians already following their own directions provoked a change in my music. As always not just one project. I’m trying to find as more gigs as possible with my regular trio (with bass clarinet and drums) playing my “compositions”. Meanwhile I’m about to begin the recording of five solo compositions for five different instruments (trumpet, alto sax, flute, double-bass, guitar). Five pieces written following an easy but quite personal method of composition I’ve been exploring for some years. Moreover I’m creating a new quartet with some very young musicians (piano, sax, drums) met during one of my workshops about improvisation. They accepted to work around some compositions of mine and the repertory is ready now. Eventually I continue to practise improvised music with the higher number of musicians possible. A necessary practice to me. Like breathing. Hope to realize an interesting project with my old friend Veryan Weston soon, for instance. We’ll speak about that at the proper moment.